Landscape Construction – Pacific Paving Ltd.
Pacific Paving is excited to provide our clients with high quality, professional landscape construction for Toronto properties. Our team is prepared in the many aspects of landscape construction, enabling us to approach each project with the utmost attention to detail. We understand that each property is unique and has various factors that need to be considered before operated upon; our experience in the industry gives us the ability to properly scout and examine the particulars of each project before deciding the best course of action. Our Landscape Construction Services include but are not limited to foliage integration, asphalt paving and concrete paving. One of our services in landscape construction is plant or foliage integration. For a property to form a polished, well–manicured look, properly planted trees must be present to assist in enhancing the area’s appearance. Strategically placed and properly planted trees will ensure that maintenance is easy and that the plants will provide healthy benefits in both appearance and the quality of air on the property. We consider the plant’s drainage requirements, soil type and drainage characteristics in order to give our foliage the best chance of growth and success. By carefully examining the quality and layout of the property before implementation, we ensure that we can find the best fit possible for the property. Drawing from the experience of our team, we will utilize the optimal planting techniques which affects water quality, fertilizer use and pesticide use in order to maximize the longevity and health of the plants on the property. Pacific Paving is delighted to be able to provide the best landscape construction in Toronto, Mississauga, Burlington, Newmarket, Brampton and Oakville. 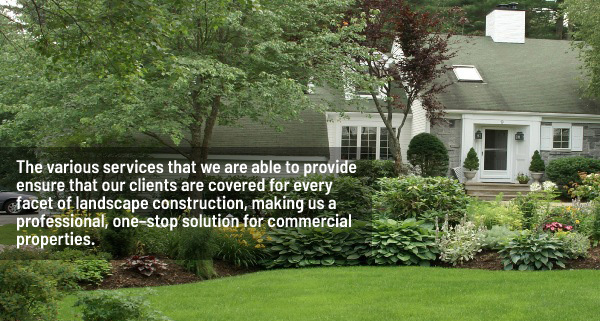 Our team is steadfast in its commitment to provide a variety of landscape construction services while maintaining the renowned quality of our work. We trust that our dedication to the process will result in professional quality landscapes that will exceed the high expectations of our clients. Our services include storm, water rain, sanitary lines concrete repair, paving, asphalt catch basin, drainage along with other types of related work. 24 hr, 7 days a week, 365 days a year.